At the dawn of the 18th century brewing was still largely a domestic or small-scale commercial activity supplying an essential element of diet and solace to an agrarian population. Three centuries later it is an industry increasingly dominated by a few large companies striving for global supremacy in the supply of branded recreational alcoholic beverages. This paper outlines the part played by science and technology in these changes. Perhaps the best claimant to be the founding father of fermentation science is Georg Ernst Stahl [Fig. 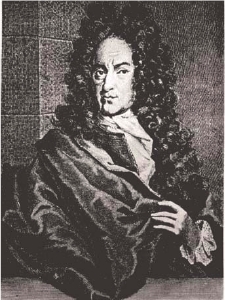 1], a German chemist and Prussian court physician, who in 1697 published a book entitled Zymotechnica Fundamentalis (Fundamentals of Fermentation Technology). In his book, Stahl takes fermentation out of the realms of magic, where it had been placed by the alchemists, and into the world of chemistry. He regards fermentation as being associated with chemical recombination and hence capable of analysis. His purely inanimate theory of the process is wide of the mark, but his book is important as arguably the first recorded attempt at an interface between science and brewing technology. Stahl was well aware of the economic importance of the craft of brewing in Germany and specifically set out to seek a chemical interpretation of the process.1 In the event, there is no evidence that Stahl's book had any impact on practical German brewers at the time. Originally published in Latin, a German translation did not appear until 1734 by which time the industrialisation of brewing had begun in earnest elsewhere. The growth in population of Europe's cities was to prompt step changes in the scale of operation of breweries. London, capital of the first industrialised nation and the world's biggest and fastest growing city provides the earliest example of this phenomenon. Even at the beginning of the 18th century beer production in London was dominated by 'common brewers' who distributed beer to a number of public houses, many either owned or otherwise tied to them. Output from this source exceeded that of 'brewing victuallers', who brewed only for sale in their own taverns by a factor of over 100:1. In the country as a whole the output ratio at the time was 1:1. By 1750 the average annual output of London's top five common brewers was an impressive 50,000 barrels; by 1799 it was 150,000 barrels.2 The breweries of Thrale/Barclay Perkins, Whitbread, Truman, Meux and Calvert were wonders of Georgian England. The product of these mammoth breweries, which far outstripped in size any others elsewhere, was a vinous, bitter tasting inexpensive brown beer commonly known as porter. The first record of in-process quantitative measurement in brewing operations is the use of the thermometer by the London ale brewer Michael Combrune in the 1750s. Combrune experimented with the drying temperatures required to give malts of different colours and recorded observations on mashing and fermentation temperatures. A big step forward came in the 1780s when John Richardson, a Hull brewer, introduced his saccharometer for the measurement of the of wort strength [Fig. 2].5 For the first time the relative value and efficiency of use of extract yielding materials could be quantitatively assessed with consequent economic benefits to the brewer.6 By 1800 many of the larger common brewers had adopted the instruments which were promoted in treatises on brewing science and practice. From the writings of Richardson and his contemporaries7,8, which recorded original and sometimes present gravities, a rough calculation of the alcoholic strength of beers at the turn of the 18th century is possible. The data show wide variations, but tend towards the following approximate bands for per cent alcohol by volume: strong ale 7-10%, porter 6-7%, common ale 5-7% and small/table beer 2-4%. Significant features of the 19th century were the growing output of breweries, the switch away from crude dark heavy beers to more delicate and more difficult to produce styles, and the advent of all year round brewing. All these encouraged, and were to an extent mediated by, the application of science in brewing. Trade/technical journals and societies proliferated from the 1860s with Germany again leading the way.13 The Allgemeine Brauer- und Hopfen- Zeitung (known today as Brauwelt) was founded in 1861 at Roth near Nuremburg. Carl Lintner's journal Bayerische Bierbrauer came out in 1866. In the UK, the Brewers' Journal appeared in 1865 and the Brewers' Guardian in 1871; the Transactions of the Laboratory Club, which became The Journal of the Institute of Brewing, was first issued in 1886. In 1882 The Australian Brewers Journal was launched and what eventually became The Master Brewers’ Association of the Americas was formed in 1887. Until Louis Pasteur [Fig. 4] carried out his investigations on wine and beer fermentations in the 1860s and 1870s and showed the importance of eliminating deleterious bacteria, there was little useful known about the microbiology of brewing. Even the identity of yeast remained in dispute, despite convincing evidence that it was a living organism having been produced by three independent observers in the 1830s.14 Curiously, although Pasteur's work on beer was carried out with the declared aim of redressing the balance in France's favour against the clearly superior German brewing industry, German breweries were amongst the first to employ heating of beer, i.e. pasteurisation, in order to preserve it.15 Pasteur claimed the treatment as too severe for beer and did not recommend it in his famous book Etudes sur la Bier published in 1876. 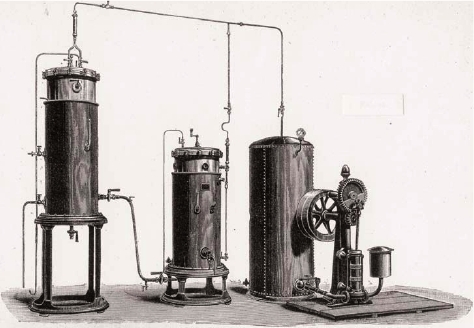 Rather, Pasteur devised a system of brewing which prevented ingress of bacteria in the first place, but his procedure found few users until closed fermenters became the norm in the second half of the 20th century. Emil Christian Hansen on the other hand soon found his ideas being applied after he introduced the concept and the technology for achieving pure yeast culture at Carlsberg in 1883. Within ten years Hansen's yeast propagation plants had been installed in 173 breweries in 23 different countries [Fig. 5].16 By then, Alfred Jorgensen was supplying some 65 other breweries with pure yeast from his laboratory in Copenhagen. The experimental station at Nuremberg was providing a similar service to 100 or so small German breweries and the Wahl-Henius Institute was servicing more than 60 breweries in the USA. In contrast to this example of rapid 19th century technology transfer, for a variety of reasons few UK brewers adopted pure culture methods. Certainly a single yeast strain was incapable of producing English stock ale, but the technique was readily applicable to the production of running beers.17 Not until the 1960s would pure yeast culture begin to find wide application in the UK. The brewhouse saw significant changes during the 19th century. Use of mashing rakes powered by horses and then steam were the norm by 1800 in large breweries. By then the old technique of multiple extraction of a batch of malt to produce worts of decreasing strength and then fermenting them separately to produce different beers had largely been superseded. Worts were now blended prior to fermentation in order to produce a single beer or range of beers (parti-gyle). After 1800 the technique of 'sparging' was increasingly introduced. This procedure, which seems to have originated in Scotland, was universal by the 1870s. James Steel introduced his external mashing machine to give efficient mixing of ground malt with water on entry to the mash tun in 1853 and it and devices like it soon found favour. Cast iron, which was seen as ‘clean and lasting’ became the material of choice for the mash tun itself, taking over from oak. Copper also had its supporters but was usually ruled out on cost grounds. By the end of the century, the tower design which was entirely reliant on gravity for flow of liquids through the brewery, and only really worked well and easily in small breweries, had matured into the 'semi-gravitational' system. In the latter procedure wort is pumped once from the hop-back to the open cooler placed sufficiently high to command the water cooled ‘refrigerators’ and fermenting tuns. From the 1870s, following the work of Carl Linde in Germany, the increasing availability of efficient ammonia refrigeration machines freed lager brewers from the need for natural ice. Cold transport of beer became easier and lager and ale brewers alike adopted all year round brewing. Refrigeration was initially used to produce ice but was soon applied to direct cooling via expansion coils. In the USA use of high levels of adjunct coupled with the development of an accelerated brewing process where storage time was minimised and filtration used for clarification, led to the development of unique very pale coloured beers of unrivalled blandness. In the UK, Gladstone's ‘Free Mash Tun’ act of 1880, which transferred tax from malt to beer allowed brewers to use any sources of extract they pleased. Soon the trade press was full of engravings of rather frightening ‘raw grain converters’ for processing maize and rice [Fig. 6]. In the event, brewers tended to buy liquid sugar, or cereals already converted into more manageable flakes or grits, rather than process the material themselves. Soon adjunct usage was heading towards 20% of the grist, even though the two biggest brewers, Guinness and Bass, eschewed their use. This prompted a campaign for ‘pure beer’, i.e malt only beer, which was orchestrated by the barley growers and the maltsters who raged against the use of ‘adulterants’. In fact the use of true adulterants had been in retreat since the beginning of the century when such abuses had reached a peak at the time of the Napoleonic Wars and consequent high malt taxes. Gone were the days when such ingredients as ‘Grains of Paradise’ and ‘Cocculus Indicus’ which ‘poisons fish and stupefies man’ would find their way into beer. Bottling of beer, although probably started in earnest in the early 1700s, was of little importance until the 1860s. Bottles were originally corked; internal screw stoppers were patented in 1872, swing stoppers in 1875 and crown corks in 1892.18 Hand bottling was the only option until the 1880s when bottling machinery was introduced prompting a surge of interest. Lighter beers were produced specially for bottling using proportions of sugar and unmalted cereals. These adjunct beers tended to stay bright longer than all-malt beers. Narrow mouthed bottles were patented in 1886. Multiple head filers appeared in 1899 and fully automatic rotary fillers in 1903. 'Naturally conditioned' bottled beer, packaged with a proportion of yeast and fermentable matter still present allowing continued limited fermentation which generated carbon dioxide and gave it sparkle, remained the most usual product in many countries well into the 20th century. Gradually, however, it lost ground to 'nondeposit' bottled beer which was filtered and artificially carbonated using techniques introduced from the US, where this type of beer was the norm by the 1890s. Bottled beer is estimated as having taken 20 per cent of the US market by 1900 and ten years later one third of the beer sold in North Germany was bottled. The great majority of 19th century UK brewing companies, whether or not they maintained a laboratory for their brewer, relied upon consulting chemists for expert analytical services and advice, particularly in times of difficulty. There were over a dozen specialists operating from London by the 1880s with others in the provinces. Major figures included Edward Ralph Moritz, Alfred Chaston Chapman [Fig. 7], John Heron and Lawrence Briant. These men built up considerable reputations and made a decent living from their practices which continued to thrive well into the 20th century. Chaston Chapman, a great self publicist who was elected a Fellow of the Royal Society in 1920, occupied a whole building in Aldgate. Outside the UK brewers sought to meet their analytical requirements in a variety of ways. In Germany, specialist brewing testing and experimental stations attached to higher education establishments at Weihenstephan, Berlin, Nuremberg and elsewhere provided analytical services, and few breweries employed specialist analysts. The USA followed the mixed English model, although German immigrants largely ran the industry. The Danish born Max Henius and the American Robert Wahl established a consultancy in Chicago in 1884 and consulting chemists operated in New York and elsewhere. Anheuser-Busch claim to have started the first brewery research laboratory in the US in the 1870s.23 The Pabst brewery in Milwaukee appointed a German Ph.D., Otto Mittenzurly, to their staff in 1886. Carlsberg, with the microbiologist Hansen [Fig. 8] and the chemist Johan Kjeldahl [see front cover], established what was to become a world famous laboratory in Copenhagen in 1876. Their Danish rivals, Tuborg, followed suit on a somewhat less grand scale. Practicing brewers have always been more interested in technology than in science and innovations of obvious practical utility were eagerly adopted as the new century dawned. For example, the improved Seck mill introduced in 1902, which had three or even four pairs of rollers, was an immediate success. Richard Seligman's counter current plate heat exchanger (the 'paraflow', originally used for milk and then adapted for use with beer) also met with wide acceptance within a few years of being patented in 1923. Other developments were more consumer driven. 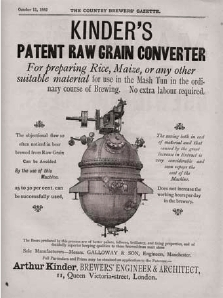 The habit in the USA of putting beer in the 'ice-box' prompted Leo Wallerstein to patent the use of proteolytic enzymes to prevent chill haze in 1911.24 Even so, radical technological change was only attempted by the most adventurous brewers in the UK who experimented with mash filters, new designs of fermenters and metal beer containers. In general, faced with in a stagnant market, the UK brewing industry cut a poor figure in the first half of the 20th century. Hidebound boards of directors presided over decaying breweries with ageing plant turning out dull beer which deteriorated quickly in poorly run pubs. Investment in scientific research in brewing has never been high, even in the context of the relatively low spending food industry. Until after the Second World War expenditure was vanishingly small in most countries as recession took hold and nervous management retrenched. In the UK the brewing industry was spending an estimated 0.003 per cent of its turnover on research in the late 1930s - a figure lower by a factor of three than any other industry surveyed.25 Raw materials were the primary targets for the limited research effort of this period, the brewing process itself receiving little attention. Breeding of improved hop and barley varieties began in the early years of the century, starting a trend which would lead to hops containing much higher levels of bittering power and barleys which combined high extract and good agronomic properties. New barley varieties became generally available in the 1920s and studies on the chemistry of hops revealed the basic structure of alpha acids in the same decade. Unraveling isomerisation and the consequent release of bittering power during wort boiling had to wait until the 1950s. In the 1930s chemical and microbiological analytical techniques were extended and improved as the rise in sales of bottled beer required more attention to be paid to aspects of beer flavour, shelflife and appearance (clarity, foam and sparkle). Analysis thus became increasingly a tool in seeking competitive advantage in the marketplace, complementing its long-standing role as a guide to production integrity and efficiency. But science only impinged on the periphery of the average brewer's vision. The brewers' chemist of the '30s held a relatively lowly place in the hierarchy, ranked around the level of the second brewer to judge from his remuneration, with a status similar to that of the head bookkeeper. As one insider was to note26 rather sourly: '… brewers employed a chemist in an obscure laboratory as a sort of scientific chaplain in an otherwise unscientific industry ...'. 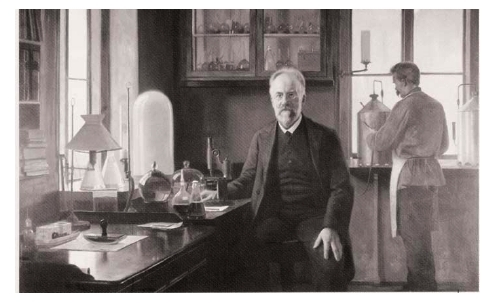 Certainly, excluding the special circumstances of those employed in the Carlsberg Laboratory, the days had gone when the brewers' chemist could make a contribution to mainstream science as had been the case with Cornelius O'Sullivan, Horace Brown et al. Indeed the community of scientists in the brewing industry became increasingly inward looking and took no part in the wider world of their disciplines. This insularity was to persist. Even in their heyday in the third quarter of the 20th century, scientists employed in breweries were rarely to be found publishing in journals, or participating in meetings and conferences, other than those specifically related to brewing. Although women were closely associated with domestic and publican brewing (hence the term brewster) they have been much less prominent in industrial brewing. Indeed some have argued that women became excluded from brewing once it became a viable commercial activity. Certainly, the laboratory was one of the first areas where women reached parity with men during the 20th century. Women provided much of the labour in bottling stores from the 1870s, were employed in clerical roles and as 'typewriters' from the 1880s, and worked as technicians in laboratories from the 1920s. After World War II, more responsible roles in laboratories, marketing, information science, finance, and eventually as brewers followed. But industrial brewing has remained essentially a male preserve at the highest levels. Few women have become directors of brewing companies. From the late 1940s investment in scientific research into the brewing process was increased to unprecedented, if still modest levels. 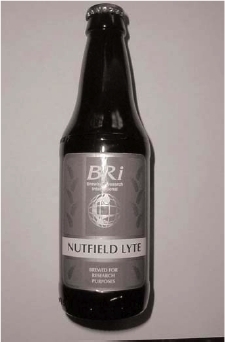 In the UK the Brewing Industry Research Foundation (BIRF), paid for by a barrelage-based levy of the British brewers, was officially opened at Nutfield in Surrey in 1951.27 The first director Sir Ian Heilbron FRS, a prominent organic chemist from Imperial College, had firm views on what the Foundation should be about. In an early paper28 outlining his aims for the new venture he noted that it would be 'A scientific headquarters furthering the application of science to the solution of tactical problems and to the strategic development of the industry'. He saw these activities as 'complementary and in no way conflicting' and stated that 'the engagement in fundamental research is a duty, not a luxury which the industry can permit itself'. In the first 25 years of its existence the staff of, at its peak, over 100 scientists and support staff at BIRF published over 700 original papers. The post-war enthusiasm for science touched breweries in most countries, with specialist laboratories and pilot plant facilities established or extended in universities and technical institutes and by major brewers in the 1950s and 1960s. Detailed understanding of the chemistry, biochemistry and microbiology of malting and brewing followed. By the end of the 1970s highlights included knowledge of the enzymology of barley germination and mash conversion, the chemical structure of hop components and the mechanism of formation of major beer flavour compounds including diacetyl, esters, higher alcohols, and the prime determinant of the flavour of German helles lager, dimethyl sulphide. Until the 1950s floor malting was the most usual procedure in many countries, with grain after steeping spread on a solid floor, kept cool during germination by hand turning with a shovel and dried in a kiln directly fired by coal or coke. This labour intensive system was largely replaced in the next 30 years. Maltings became mechanised, access to air was given during steeping, drums and then perforated rotating floors were adopted for germination. Oil and then methane gas were used for kilning. In the 1980s it was found that the latter promoted the formation of carcinogenic nitrosamines and indirect firing was introduced as standard. In a totally new departure the use of a plant hormone (gibberellic acid (GA)) together with a growth restrictor (potassium bromate) became popular in the 1960s as a means of accelerating malting without increasing losses.31 The use of bromate ceased in the 1980s with improved temperature control, and the popularity of GA also decreased. A limited degree of battering or 'abrasion' of barley prior to steeping as a means of accelerating malting gained transient popularity, at least amongst brewer-maltsters, in the 1970s, but soon faded from view.32 By the end of the century, malting was carried out in large plants (annual capacity 50-100 thousand tonnes) and total processing time was about half of what it had been fifty years earlier. Consequently the malting industry experienced consolidation; 30 companies made 60 per cent of the world's malt by the beginning of the 21st century. Steam boiling, as opposed to directly fired coppers, had been in use from the 1870s, but did not gain wide acceptance until well in to the 20th century. For malt extraction, the two vessel (mash and lauter tun) system of brewing which facilitated wort separation became the norm even for ale brewing from the 1960s. Lauter tuns in turn began to lose ground in some quarters from the 1980s as mash filters, first used a century earlier, were increasingly adopted in an improved form. The breeding of hops with much higher levels of alpha-acids - a more than four fold increase over the century - led to much lower hop rates.34 Whole cone hops, the only method of bittering at the start of the century, came to be replaced by milled and later solvent extracted preparations. Commercial preparations of pre-isomerised alpha-acids became available in the 1950s and 1960s but failed to find wide acceptance other than for final beer bitterness adjustment in most companies. 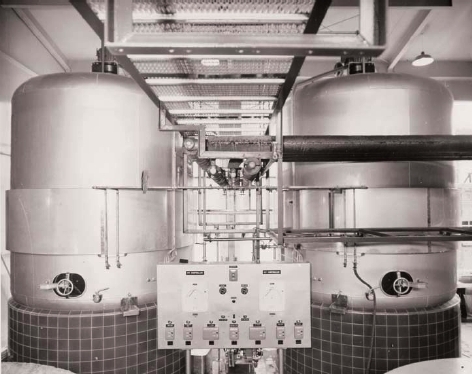 The whirlpool separator for removing hop and other residues after wort boiling, was introduced to replace the more cumbersome hop-backs at Molson's brewery in Canada in 1960,35 and was ubiquitous in breweries by the 1980s. Syrups produced using enzymes were being used by brewers in the 1950s and the first beer brewed using 100 per cent barley converted with exogenous enzymes as a complete replacement of malt was sold in 1963.36 Barley brewing never found wide acceptance, but the use of enzymes as palliatives became popular amongst nervous brewers who wished to avoid or prevent problems in wort production and beer stability. Adjustment of the mineral composition of water by addition of salts had been practiced since the previous century, and from the 1980s demineralisation followed by construction of the appropriate water from scratch, depending upon the type of beer to be brewed, increased in popularity. High gravity brewing, where beer is brewed and fermented at higher than sales gravity and is then diluted, was popularized and optimised in the 1970s and became the norm by the mid 1980s, allowing better plant utilisation. Sophisticated post fermentation treatments delayed haze development and improved techniques for excluding oxygen during packaging meant that beer flavour shelf-life was also extended, often to a year or more. Wood, then glass, lost out to metal as the keg and can, pioneered in the 1930s, gained ground and filling line speeds increased. If hopes for continuous brewing in the 1950s went unfulfilled, then the same is true of the belief which took root in some quarters in the 1980s of the potential for utilising genetically modified (GM) yeast strains.40 Again much research effort was directed at what became a hot topic and this was met by a measure of scientific achievement. A genetically modified yeast for use in low carbohydrate beer fermentation gained regulatory approval in 1993 and numerous other strains designed to give a technological advantage were constructed, but no GM strains have to date been used in commercial brewing. Similarly, targets for genetically modified barley have been identified by scientists and progress made towards achieving these goals, but the drinks industry remains unconvinced.41 While public opinion on genetic modification, and genetically modified food in particular, remains so negative, companies are unwilling to imperil the expensively generated image of their brands for marginal advantage.42 Only in the USA has there been apparent wide public acceptance, or at least indifference, to genetic modification. Transgenic maize has become ubiquitous in the USA and has necessarily used in brewing. Elsewhere in the world brewers took pains to reassure the public that their beers were free from genetically modified material. Carlsberg, leading European users of maize for brewing,43 turned their back on the cereal for this very reason in 2000. With gathering pace, instrumentation transformed laboratory practice in academic and industrial laboratories in the second half of the 20th century. 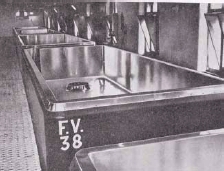 Wet chemical methods and laborious microbiological techniques largely disappeared and were replaced by sophisticated, sometimes automated, procedures. Productivity increased such that laboratories which had bustled with people in the 1960s and '70s had instead filled up with instruments by the 1990s. At-line, on-line and in-line analyses were taken up by increasing numbers of breweries from the 1980s and seemed likely to lead to the eventual effective disappearance of control laboratories altogether.44 Breweries also relied increasingly upon external specialist laboratories rather than in-house expertise. This latter move, having echoes of the widespread use of the consulting brewer and chemist of a century earlier with all 'his dangers and his uses',45 was consistent with an industry which embraced the attitudes and jargon of 'outsourcing', 'best value', 'externalisation' etc. throughout its activities. The belief in the utility of scientific research which developed in the brewing industry after the Second World War proved short lived. Activity in breweries, never widely or firmly based, stalled in the1980s and all but evaporated in the 1990s.46 Research laboratories and pilot plants closed and budgets were cut. Original publications from major breweries in the UK and North America, once major features in journals and at conferences, dried up. Remaining funds were directed primarily towards 'near market' product and packaging innovations. What is now called Brewing Research International (BRi) at Nutfield, lost central funding from the increasingly unstable British industry, reduced staffing levels to half of those of its heyday and re-focussed activities on service analysis, training and contract work, rather than research. An exception to this move to what its adherents called 'the new realism' and what its opponents called 'short-termism' was Japan, where contributions to brewing science had been increasingly evident from the 1980s. In a highly competitive industry, Japanese companies heeded the often given but seldom taken advice of economists on the particular need to continue to find the money to support both short and longterm research in a depressed economy. Bud, R. (1993) The Uses of Life. A history of biotechnology. Cambridge: Cambridge University Press. 8-11, 21. Mathias, P. (1959) The Brewing Industry in England 1700-1830. Cambridge: Cambridge University Press. 6, 542-545, 551- 552. Mathias, P. (1979) The Transformation of England. Essays in the economic and social history of England in the eighteenth century. London: Methuen. 210. Bennison, B. (1999) ‘Adoption of steam by North-Eastern Breweries during the Nineteenth Century’, Brewery History. Journal of the Brewery History Society. 98:49-56. Anderson, R.G. (2004) ‘Richardson, John (1743-1815)’, Oxford Dictionary of National Biography. Oxford: Oxford University Press. Sumner, J. (2001) ‘John Richardson, saccharometry and the pounds-per-barrel extract: the construction of a quantity’, British Journal for the History of Science34:255- 273. Richardson, J. (1788) The Philosophical Principles of the Science of Brewing. York. Baverstock, J.H. (1824) Treatises on Brewing by the late James Baversock. London. Teich, M. (1981) ‘Ferment or Enzyme: What's in a Name?’, History and Philosophy of the Life Sciences. 3:193-215. Anderson, R.G. (2003) ‘Beer’. In: Blocker, J., Tyrrell, I. and Fahey, D. (eds.) Alcohol and Temperance in Modern History: An International Encyclopaedia. Santa Barbara: ABC-Clio, Vol.1, 92-100. Kruger, R. (1990) The History of Weihenstephan. Brauwelt International 4:296- 297. Manners, D.J. (2001) Brewing and Biological Sciences at Heriot-Watt University 1904-1989. Edinburgh: Heriot-Watt University. Glamann, K. (1981) ‘Founders and Successors. Managerial Changes during the rise of the modern brewing industry’. Proceedings of the 18th European Brewery Convention Congress. Copenhagen, 1-10. Anderson, R.G. (1989) ‘Yeast and the Victorian Brewers: Incidents and personalities in the search for the true ferment’. Journal of the Institute of Brewing. 95:337-345. Anderson, R.G. 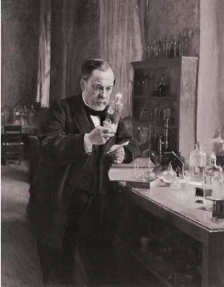 (1995) ‘Louis Pasteur (1822-1895): An assessment of his impact on the brewing industry’. Proceedings of the 25th European Brewery Convention Congress. Brussels, 13-23. Anderson, R.G. (1993) ‘Highlights in the History of International Brewing Science’. Ferment. 6:191-198. Anderson, R.G. (1998) ‘Horace Brown and “Friends”: A Triumvirate of Sequicentenaries’. Ferment. 11: 325-328. Puddick, A.J. (1971) ‘Changes in British bottling techniques. In: One hundred Years of British Brewing’. The Centenary Issue of the Brewers' Guardian. 117-119. Anderson, R.G. 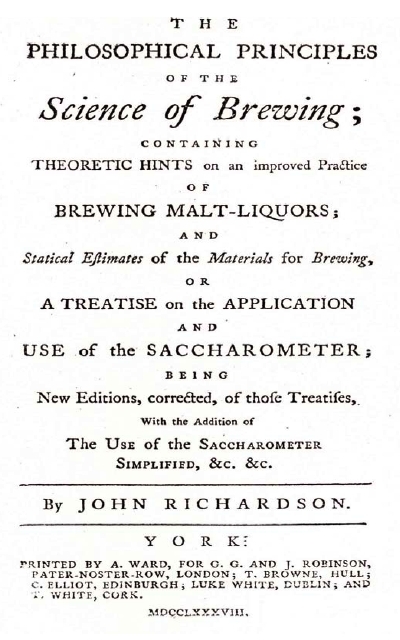 (2002) ‘From Saccharometer to Hartong Number: Analysis in the Brewing Industry, 1780-1940’. Royal Society of Chemistry Historical Group Newsletter. August, 13-15. Pearson, L. (1999) British Breweries. An Architectural History. London: The Hambledon Press. 93. Anderson, R.G. (in preparation) Gravity, Tint and Bitterness: A history of the brewers' chemist. Anderson, R.G. (1992) ‘The Pattern of Brewing Research: A Personal View of the History of Brewing Chemistry in the British Isles’. Journal of the Institute of Brewing. 98: 85-109. Anon. (1995) The History of Anheuser-Busch Companies. A Fact Sheet. St Louis: Anheuser-Busch Inc. 12. Wallerstein, L. (1956) ‘Chill proofing and stabilisation of beer’. Wallerstein Laboratories Communications. 19(65):95-110. Seligman, R. (1948) ‘The Research Scheme of the Institute - its Past and its Future’. Journal of the Institute of Brewing. 54:133-140. Pyke, M. (1963) ‘A Biologist in Industry’. Institute of Biology Journal. 10:102- 108. Anderson, R.G. (2002) ‘Brewing Research International: A survivor in changing times’. Journal of the Brewery History Society. 108:56-58. Heilbron, I. (1950) ‘The Research Foundation and its place in the industry’. Brewers' Guardian. 80(3):12-16, 87. Bradford, R. (1907) ‘Notes on the Construction and Design of Breweries and Maltings’. Journal of the Institute of Brewing. 8: 534-558. Anderson, R.G. (1994) ‘Past Milestones in Malting, Brewing and Distilling’. In: Campbell, I. and Priest, F.G. (eds.) Proceedings of the Fourth Aviemore Conference on Malting, Brewing and Distilling. 5-12. Ray, G.F. (1974) ‘The Application of Gibberellic Acid in Malting’. In: Nabseth, L. and Ray, G.F. (eds.) The Diffusion of New Industrial Processes: An International Study. Cambridge: Cambridge University Press. 215-231. Hudson, J.R. (1983) ‘Impact of research in brewing practice: past, present and future’. Proceedings of the 19th European Brewery Convention Congress. London. 13-32. Munroe, J.H. (1995) ‘Fermentation’. In: Hardwick, W.A. (ed.) Handbook of Brewing, 1st Edition. New York: Marcel Dekker, 323-353. Darby, P (1997) ‘A Century of Hop Breeding’. In: RH Beach, R.H. (ed.) Brewing Room Book 1998-2000. Ipswich: Pauls Malt. 57-61. Hudston, H.R. (1969) ‘The Story of the Whirlpool’. Technical Quarterly of the Master Brewers' Association of America. 6:164-167. Crisp, J.W.M. and East, E. (1971) ‘The use of added enzymes in the production of wort’. Proceedings of the 13th European Brewery Convention Congress. Estoril. 185- 190. 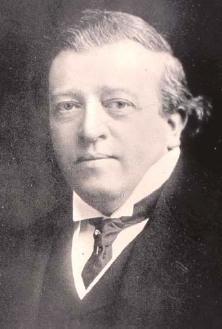 Lenihan, J. (1988) The Crumbs of Creation. Bristol: Adam Hilger. 49-50. Anderson, R.G., Brites Sanchez, A., Devreux, A., Due, J., Hammond, J.R.M., Martin, P.A., Oliver-Daumen, B. and Smith, I. (2000) European Brewing Convention Manual of Good Practice: Fermentation and Maturation. Nuremberg: Fachverlag Hans Carl. 124-129. Masschelein, C.A. (1997) ‘A realistic view of the role of research in the brewing industry today’. Journal of the Institute of Brewing. 103:103-113. Molzahn, S.W. (1987) ‘Genetic Engineering: Yeast’. Proceedings of the 21st European Brewery Convention Congress. Madrid. 197-208. Anderson, R.G. (2000) ‘Current practice in Malting, Brewing and Distilling’. In: Morris, P.C. and Bryce, J.H. (eds.) Cereal Biotechnology. Cambridge: Woodhead. 183- 214. Verstl, I. (2000) ‘Gone with the Wind: Will Soft Issues be Relevant for International Brewing in the Future’. Proceedings of the 26th Convention of the Institute of Brewing Asia Pacific Section. 22-28. Munck, L., and Lorenzen, K. (1977) Proceedings of the 16th European Brewery Convention Congress. Amsterdam. 369-376. J Pollock, J. (1997) ‘The World's Brewing Industry in the Twentieth Century’. In: Beach, R.H. (ed.) Brewing Room Book 1998-2000. Ipswich: Pauls Malt. 28-30. Bowly, J.E. (1896) ‘The Consulting Brewer: His Dangers and his Uses, with some Practical Brewing Notes’. Journal of the Institute of Brewing. 2:86-98. Briggs, D.E. (2000) ‘The Horace Tabberer Brown Memorial Lecture: Malt Modification - A Century of Evolving Views’. Proceedings of the 26th Convention of the Institute of Brewing Asia Pacific Section. 13-21. Anderson, R.G. (in press) ‘History of Industrial Brewing’. In Stewart, G.G. and Priest, F.G. (eds), Handbook of Brewing. New York: Marcel Dekker.